The evidence discussed in my recent posts indicates that for moderately fit individuals there is only a narrow gap between the training load required to produce useful improvement in performance and that which results in the over-reaching that leads to reduced benefits of training. Hence to obtain optimum benefit from training, it is necessary to have a reliable way of estimating recovery from previous training sessions. Furthermore, the evidence, especially the evidence for the recent studies by Kiviniemi and colleagues [1, 2] indicates that adjusting training according to heart rate variability HRV) measured in the resting state each morning might lead to more efficient training. As discussed in my post on 13th July, I think this evidence is promising but not compelling. Many athletes use heart rate during exercise itself as a guide to progress with their training. Assessment of fitness such as that proposed by Hadd, which employs the relationship between pace and heart rate, assessed over a range of different heart rates, are based on the assumption that a lower heart rate at a given pace is an indication of increased fitness. On the other hand, when fatigue begins to build up during moderately heavy training, heart rate at a given pace tend to rise indicating the first phase of over-reaching. In contrast, during very heavy training, a decreased heart rate at a given pace can actually indicate parasympathetic over-reaching. Provided the measurements are interpreted in context, gradual changes in heart rate at a given pace over a period of many weeks can be a useful guide to changing level of fitness, while short term changes can provide an indication of over-training. These observations raise the possibility that HRV during exercise might be a useful guide to the degree of exhaustion during a training session. However, there is surprisingly little published information regarding the interpretation of HRV during exercise. Why should this be so? The main problem is that whereas HRV at rest is very strongly influenced by the autonomic nervous system, it is not clear what are the main factors influencing HRV during vigorous exercise. Figure 1 shows a trace which I recorded last year using my Polar RS800cx in R-R mode, during a graded exercise session on the elliptical cross trainer in July. (Note the figure shows beat-by-beat values of heart rate, which is the reciprocal of R-R interval). After two minutes of standing still, I exercised at a cadence of 80 cycles per minute and adjusted the resistance such that the power output increased from 30 watts in 7 approximately equal steps, each lasting 4 minutes, up to 230 watts. After completing 4 minutes at 230 watts, I maintained an output of 30 watts for a further 4 minutes and then stood still for another 4 minutes. There are a number of idiosyncratic features of the trace which I will ignore for the present discussion. These include sharp spikes which might be premature atrial beats (or artifact due to disrupted electrode contact). The dip in heart rate to a value below 80 bpm lasting for around 20 seconds at 5 minutes is a typical feature which I observe in many of my recordings while in the lower part of the aerobic zone, and at present remains a mystery to me. I have seen this feature in the recordings of other athletes but have not found any descriptions of these dips in published research reports. However, for present purposes, let us ignore both the spikes and the dips. 2) the amount of high frequency fluctuation reduces subsantially (the line becomes less fuzzy) as HR increases into the range from 80 to 120 bpm, if we ignore the aberrant spikes and dips. By HR 120 bpm, at around 12 minutes, there is relativley little high frequency variability, though of course HR is continuig to rise slowy under the influence of the sympathetic nervous system. 4) and finally the variability diminishes slightly as HR approaches its maximum, at around 28 minutes. (My true maximum HR is probably around160 bpm though I have not actually pushed myself to the maximum in recent years) . Figure 2a shows the Poincare plot of each interval between consecutive beats against the interval between the preceding pair of consecutive beats, over a 60 second interval around 24 minutes (power output, 200watts). If a series of beats were equally spaced, the point representing each pair of consecutive beats in the Poincare plot would lie on a straight line inclined at 45 degrees. The degree of scatter away from the 45 degree line indicates beat by beat fluctuations in HR. The amount of scatter can be quantified by calculating the quantity, SD1, the standard deviation of the scatter away from the 45 degree line. In this plot, sd1 is 4.4 ms which is typical of values I observe at the upper end of the aerobic zone. 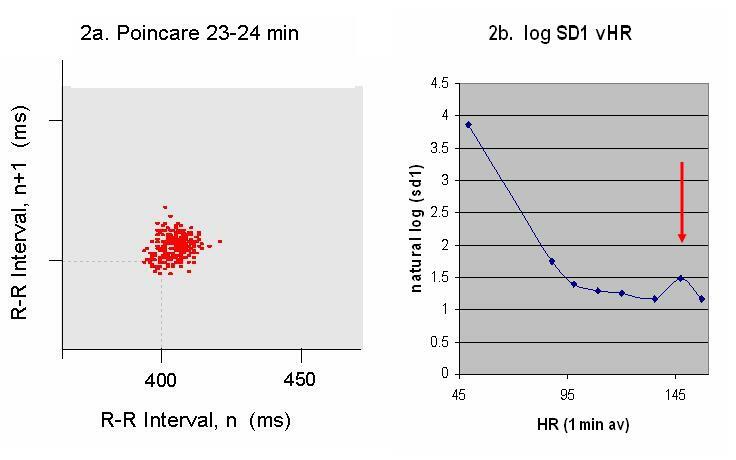 Figure 2b shows the natural log of SD1 calculated for 60 second epochs at the end of each of the 4 minute steps, when HR is relatively stable. It should be noted that estimating HRV during a period when HR is varying due to increasing work load presents problems. Various measures other than SD1, such as a scaling factor designated alpha computed on the basis of the theory of nonlinear systems (i.e. chaos theory), have been proposed, but the interpretation of such measurements is fraught with difficulty. This is illustrated by poor consistency between measurement of alpha in the same person in sessions a week apart . Hence I think it is best to employ SD1 despite the limitations of this measurement. The reason that it is conventional to plot the log of SD1 is that during the early phase of increasing exercise intensity, parasympathetic influence falls away exponentially. An exponential decay would be expected to produce a straight line when plotted on a logarithmic scale. Figure 2b confirms that high frequency HRV (as quantified by the log of SD1) falls rapidly from standing to low intensity exercise; continues to diminish gradually in the lower aerobic zone and then increases around the anaerobic threshold before decreasing again as HR approaches maximum. This is fairly typical of what is seen in other athletes, though I exhibit a more abrupt initial withdrawal than I observe in others. What determines HRV during exercise? It is widely accepted that the initial fall off in high frequency HRV (as HR increases from its resting value) is due to withdrawal of parasympathetic influence. Once in the aerobic zone, parasympathetic input is minimal and further increase in heart rate is driven by increased sympathetic activity . However, high frequency variation at around respiratory frequency is not entirely abolished even in the mid-aerobic zone, suggesting that some other factor is contributing. It is quite likely that intrinsic variability in the function of the sinoatrial node (the collection of specialized muscle cells in the right atrial wall which fire spontaneously and normally act as pace-maker) plays a substantial role. In a transplanted heart, which does not receive any input for the parasympathetic or sympathetic nervous system, heart rate variability during exercise is similar to that in a heart with intact input from the nervous system. Casadei and colleagues from Oxford carried out a study in which they used the pharmaceutical agent, atropine, to block parasympathetic nervous activity, and observed that about a third of the variability of heart rate in the lower aerobic zone, can be accounted for by non-neural mechanisms . Perini and colleagues  have argued that the most plausible alternative mechanism is mechanical. For example, respiration would be expected to produce rhythmic stretching of tissues that might change the excitability of the pace-maker leading to variability at the respiratory frequency. Furthermore, mechanical effects are a plausible explanation for the prominent increase in the magnitude of high frequency fluctuation around the anaerobic threshold, at which point respiratory effort increases markedly. However, I remain a little skeptical that mechanical effects account fully for the high frequency variation in the upper aerobic and anaerobic zones. In particular, excessive high frequency fluctuation during vigorous exercise appears to be a significant predictor of poor long term health. For example, in a large study of 1335 subjects, mainly males, Dewey and colleagues from Stanford University  demonstrated that increasing magnitude of high frequency fluctuation during vigorous exercise (and also during the recovery phase) was a significant predictor of mortality in general, and especially of cardiac mortality, in the following five years. This suggests that HRV during vigorous exercise might reflect some physiological process that is indicative of impaired cardiac well being, probably something more subtle than the simple mechanical effects of respiration. Might that putative physiological marker of impaired cardiac well-being be sensitive to the state of recovery during training? Observations of my own HRV during exercise confirm this hypothesis. Last summer, my preparation for the Robin Hood half marathon had been seriously disrupted by quite severe bout of illness in June. I had missed about 4 weeks of training, and attempted to build up training volume in July, in preparation for the race in early September. As described in my blog posting on 31st August 2009, I developed quite marked fatigue during August. In an attempt to determine if the fatigue was affecting my heart, I had repeated the graded increase in exercise on the elliptical cross trainer at the end of August, following an identical schedule with 4 minutes at a series of seven steps spanning a range of power output from 30 to 230 watts, to that employed on 18th July. The R-R trace for 31st August is shown in figure 3, while fig 3a is an expanded view comparing the variability in the period 23-25 minutes on 31st Aug with that on 18th July. Figure 4a depicts the Poincare plot based on R-R intervals at 23-24 minutes on 31st August and Figure 4b shows the natural log of SD1 calculated for 60 second epochs at the end of each of the 4 minute steps. The most prominent feature is that on 31st August, there was a much more dramatic increase in high frequency HRV as I approached the anaerobic threshold (shown by the marked fuzziness of the line around 24 minutes). Furthermore, despite a subsequent increase in power output from 200 to 230 watts, heart rate scarcely rose in the following 4 minutes. 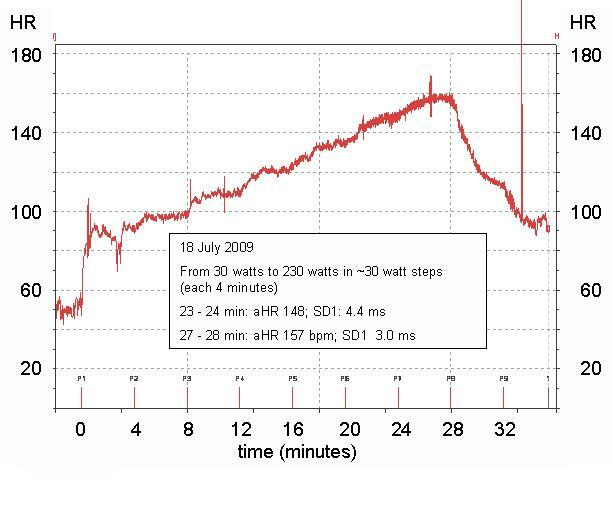 In contrast to the similar test on 18th July, when HR rose to 157 bpm at a power output of 230 watts, on 31st August the peak heart rate was 145 bpm. Subjectively, I experienced tremendous fatigue and found it very difficult to complete the 4 minutes at 230 watts. Thus, on this occasion overwhelming feelings of fatigue limited my power output and were associated with excessive high frequency HRV. 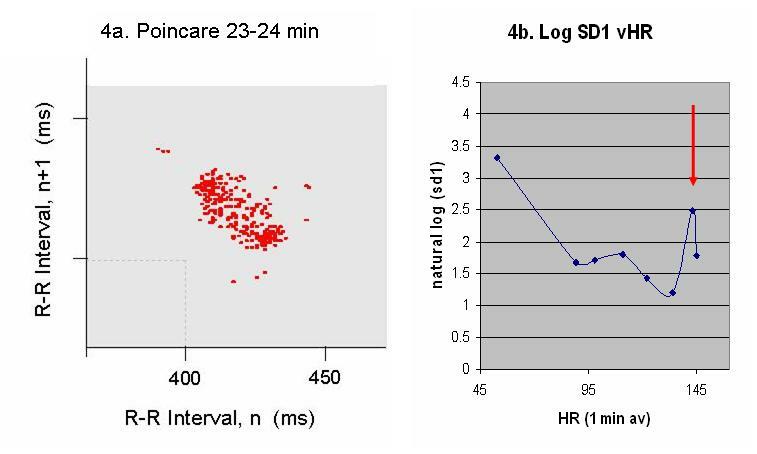 The greater amount of high frequency variability is also clear from the wide scatter of points away from the 45 degree line in the Poincare plot and the relatively large peak in the value of log (SD1) at a heart rate of 145 bpm, visible in the plot of log (SD1) against HR. (Compare fig 4a and 4b with fig 2a and 2b). 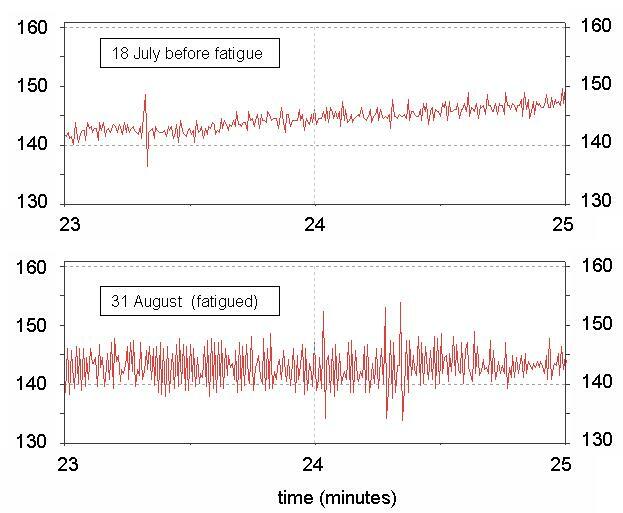 Although I have not subsequently experienced such overwhelming fatigue, there have been a number of occasions in which I have observed excessive high frequency HRV in association with moderate fatigue, sometimes when exercising in the lower aerobic zone and sometimes near anaerobic threshold. For example, a few weeks ago I became increasingly tired during a hectic week at work. On the Friday evening (18th June) I set out to do an easy 7.2Km run in the lower aerobic zone. I felt tired and lethargic throughout. 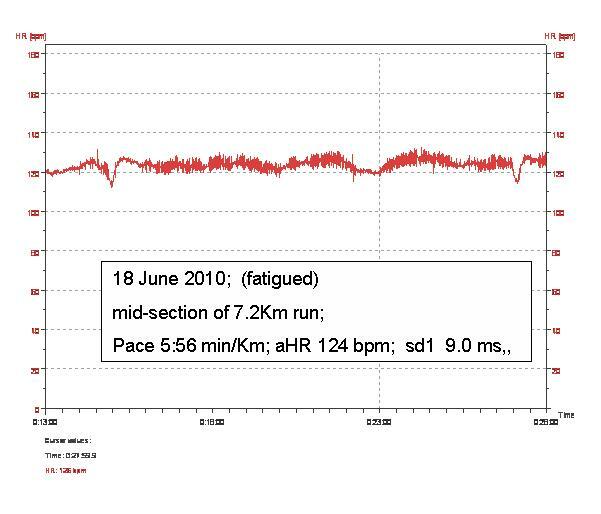 The R-R trace (figure 5) for a 15 minute segment in the middle of the run, when my pace was stable at 5:56 min/Km, shows marked high frequency fluctuation in heart rate. 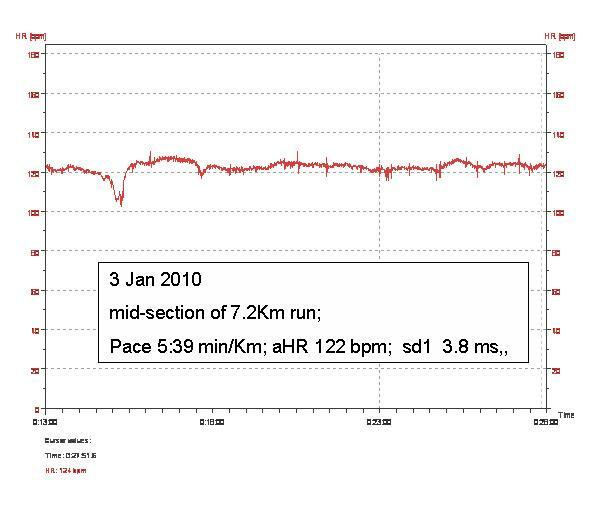 Average heart rate was 124 bpm and SD1 was 9.0 ms. For comparison figure 6 shows a similar 15 minute segment in the mid-stage of a 7.2Km low aerobic run on the same path in January. Pace was somewhat faster at 5:39 min/Km, average heart rate was a little lower at 122 bpm, and high frequency variability was much less (SD1= 3.8ms). For comparison the R-R trace during a virtually identical elliptical interval session performed a week later when the respiratory tract infection had resolved, is shown in figure 8. The magnitude of HRV is much less, and SD1 at a comparable period in the 2nd effort epoch is 2.5 ms. Although not all of the data provides quite such clear-cut information as the illustrations I have presented here, on many occasions on which I have felt fatigued or sluggish, there as been excessive high frequency HRV. This feature is observed in various different types of session including steady running in the lower aerobic zone, tempo sessions, interval sessions and progressive increases in exercise intensity from the low aerobic to the anaerobic zone. In contrast to resting HRV, where increased high frequency HRV is generally an indication of good recovery (except during advanced stages of over-reaching) increased high frequency HRV during vigorous exercise generally appears to be an indicator of greater stress. I do not know what physiological process is responsible for this. Perhaps some central governor generates ‘protective’ parasympathetic activity even at exercise intensities at which parasympathetic influence would normally be minimal. Alternatively, in view of the fact that I suffer from asthma, it is possible that these episodes of fatigue are associated with subliminal constriction of my airways that results in more labored breathing and hence greater mechanical forces on my heart. However, I have observed this phenomenon on many occasions when I am not aware of any breathing difficulty. I would be very interested to hear if anyone else has observed similar increases in high frequency variability during exercise when under stress. The dips: could they be due to transient sympathetic withdrawal? Although I have not hitherto focused on the dips in HR that I frequently observe when exercising in the lower aerobic zone, or as my heart rate drops during the recovery from intense exercise, I have marked these by black arrows in figure 8. Similar dips are also visible in figs 1,5,6 & 7 . I have no reason to connect these to the increases in HRV associated with fatigue. In fact the duration of these dips is typically 10-20 seconds. If they are due to influence of the autonomic nervous system, they might possibly reflect sympathetic withdrawal, which would be expected to act on this time scale They do not appear to be a marker for fatigue, but nonetheless I wonder whether they too might reflect a protective effect generated by a putative central governor. I have observed these dips in the traces of other athletes, but would also be very pleased to hear from others who have observed similar dips. Because of the relatively long time scale, such dips would in fact be seen more readily in a record of HR averaged over 5 second intervals. Is ‘real time’ assessment of HRV during exercise practical? If indeed the excess HRV during exercise is a reliable marker for undue stress, would this be of any practical use? The R-R trace is not generally available for inspection until after the completion of the session. However, in principle it should be possible to produce a continuous read-out of HRV averaged over a preceding period of about 20 seconds. In fact the Polar RS800cx produces a measure called RLX. Although it is difficult to obtain a precise account of the computation on which RLX is based, it appears to be very closely related to a continuous estimate of SD1. Furthermore, according to the Polar manual, it should be possible to present the continuously updated value of RLX in the display of the wrist unit. I have been unable to do this, and think that it is yet another manifestation of the fact that my particular RS800cx is infested with gremlins. However as far as I can tell from retrospective examination of RLX values, the Polar computation of RLX is based on computation over too short an interval to provide reliable values. I suspect that if I can convince myself that it would be worthwhile having access to a continuous read-out of high frequency HRV while exercising, it would probably be necessary to develop some more sophisticated way of performing the computation. Dewey FE Freeman JV, Engel G, Oviedo R, Abrol N, Ahmed N, Myers J, Floelicher VF (2007) Novel predictor of prognosis from exercise stress testing: heart rate variability response to the exercise treadmill test. Am Heart J, 153(2) 281-8. This entry was posted on July 18, 2010 at 8:09 pm and is filed under Heart physiology. You can follow any responses to this entry through the RSS 2.0 feed. You can leave a response, or trackback from your own site. Another interesting post Canute. It looks like the pre-exercise use of HRV is more useful. In any case, I wonder if most runners would stop training mid-session if a bad HRV reading told them to? Ewen, Thanks for that comment. The resting HRV record is definitely more useful in the current state of knowledge. Nonetheless, I cintinue to be interested in the question of interpreting the data collected during exercise because in most circumstances it is more consistent than HRV at rest. Even the oddities such as the dips are fairly consistent. However the interpretation is still very uncertain. Interestingly, they showed triathlete Jan Frodeno using a Suunto HRM on the TV this morning. He could upload the data to a laptop and the results could be sent to his coach when he was away from base. He didn’t say anything about HRV, but noted that, for instance, during an interval session the coach could see if the interval was run at even effort (to run a target time) or if he (Frodeno) had sprinted at the end to make the time. Ewen, That is interesting. There are accumulating strands of evidence suggesting that HRV might provide a useful guide to optimum intensity of interval training and for tempo runs. Although I have so far emphasized the role of HRV in assessing stress and recovery in my blog postings, there is moderately convincing evidence that HRV can provide a fairly accurate assessment of VT1 and VT2 – though the calculations are not trivial. Pace at VT2 is the prime determinant of performance at distances from 10Km to half marathon. It makes some sense to adjust the pace during interval session to be near VT2, and to select paces for tempo sessions that are not far below VT2 pace. Therefore the ability to measure VT2 without the need for cumbersome respiratory gas analysis could be a useful guide for adjusting training paces. I’ve been using the NAPCO Rotary gear pump for several years. Perhaps you should check them out, might help. I always use a heart rate monitor and the readings consistently go over 220 for the max. I’m an endurance runner and 48 years old. The high maximum heart rate does seem to correlate with the fatigue I feel in the latter stages of a run or ride. But I had a complete cardiac workup in April 2010 before the Boston Marathon and everything came back fine. Here are some statistics from a recent run where my Garmin took splits every mile. As you can see, the average and max heart rates were really high. It doesn’t seem to be erroneous readings by the heart rate monitor. Other recent running and cycling activities also showed similar results. My only concern is that running when my heart rate shows 253 is doing some kind of damage to my heart. I feel the fatigue, but I push through it. 2)	Heart rate monitors do not provide a reliable diagnosis of heart rhythm abnormalities so it is essential to get an opinion from a cardiologist or an electrophysiologist. Ideally one requires an EKG recorded during the period when any suspected abnormality is occurring. In my own case, this has so far proven impossible to obtain (I had a 21 day recording but during that period had no episodes of the chaotic rhythm that I occasionally observe in R-R mode of my polar heart rate monitor. 3)	In light of these limitations, any conclusions drawn from a HR monitor record must be regarded as extremely tentative. In my own case I still do not know whether or not I have Atrial Fibrillation. Having made these initial comments, based on my own experience, here are my thoughts on your HR record. Your heart rate jumped fairly dramatically as you were descending the hill towards the intersection with Melody Lane, on the outward journey. Although you had briefly increased pace half way down the hill, the elevation of heart rate persisted as your pace slowed while you continued to descend. It then remain fairly high for the remainder of the run, though the fluctuations showed a partial correspondence with changes in pace or elevation until you were approaching the intersection with Waterford Lane on the return journey. At 53:30, when you were running on the fairly level surface, you HR dropped only slightly from 240 to 230 bpm despite a marked slowing of your pace to 11:37 min/mile. Thereafter your HR remained in the range 230-250 with very little relationship to pace, for 30 minutes. This is unusual. Whether or not it is some form of atrial tachycardia or atrial fibrillation, or merely the consequence of a technical problem such as poor electrode contact, I cannot say. However, if you are seeing such patterns on a fairly regular basis, I think you should continue to investigate the situation. When your monitor shows HR in the range 230 -240, stop and palpate your pulse (either at wrist or neck). It will be difficult to count a pulse as fast as this, but you should aim to assess the regularity. After doing this, also check the tightness and position of your electrode belt. If the occurrence is fairly predictable, discuss with your physician the possibility of a portable EKG monitor, that could be activated when the monitor shows the high HR. I am sorry that I cannot offer a confident opinion. Ultimately, I think you should discuss these issues with a physician and be guided by his/her opinion. Thank you so much for taking the time to look at this. I will discuss getting a portable EKG monitor with the cardiologist. I found some articles on “heart rate drift” that seems to occur at the end of a run regardless of pace. So I was thinking that may be a possibility as well. May I take a stab at explaining why you have your early dip in HR? At Cardio Rehab they taught me that the first five minutes of any workout requires a warm up period. The warm up period historically to me was all about warming up the muscles in the exterior or structural muscles; i.e., arms, legs to ensure they would be less prone to injury. I learned that the artery cells are muscles tissue as much as the heart and the structural muscles; body has three muscle tissue types apparently. Just as structural muscles require a warm up the arteries and heart tissue also requires a warm up. It is in the first five minutes that the arteries begin to expand to provide additional blood flow to the structural muscles. Without this perfusion your heart is pumping against a slightly more closed system compared to when the arteries are fully perfused flowing blood after the initial warm up. Stress tests are designed to have the heart pump against a system giving the highest resistance, showing as much as can be seen to where blockages may be occurring. The cardiac stress test is just the opposite of what any exercise enthusiast should do getting into a workout. An easy warm up should always be taken to ensure that the arteries are fully relax/open, flowing as much oxygen to the structural and heart tissues as is possible being stressing the system in the primary workout. My take on why the dip in Heart Rate is the initial period when your arteries are going fully open to flow as much blood as possible, the heart rate during this period is not required to increase when your arteries are opening because the perfusion of your arteries is more than adequate to supply the needed oxygen without any increase in HR and even allows for a drop in HR for you. Once fully open the HR starts increasing again to pick up the load. By the way, I just came across you journal and appreciate the information that I am finding. I have been studying my HRV for some time now and also have found a few anomalies with my parasympathetic/sympathetic responses during exercise as well. I have many sets of data where I show a very similar dip in HR. When this happens to me it appears to be initialed by a physical burp and the HR dip is exactly the response shown above. I get this in the aerobic range just as you. It appears to disappear when I am above my estimated 90% HRmax. My burps occur at intervals between 8-12 minutes. I use the Suunto Heart Rate monitoring system for R-R data and Kubios software for HRV studies. I have a journal on Cardiac Athletes forum where I have posted many images of such data sets as you have shown here. Steve, Thanks for those comments. The HR traces in your post of the Cardiac Athletes site are very interesting. With regard to the fluctuation in my HR early in a session, in general, I do a fairly gentle warm up in my elliptical sessions, and also in my running sessions. On the elliptical I spend the first 2 minutes at a work rate of 28-30 watts which I regard as an easy work rate (HR typically around 90 which is approx 55-60% of max HR). However during the first two minutes while I am warming up fairly gently, the HR rises in a less stable manner than it does as I move to higher work rates. I think this instability might be related to dilation of arteries and arterioles within the skeletal muscles, along the lines you suggest, though I am not sure that dilation will result in a regular drop in HR – when the dilation occurs a larger cardiac output will be required to provide the increased volume of flow. There will be a brief period when the blood pressure drops and this would be expected to produce a reflex bust of increased HR. So overall, I would expect instability, but in addtion to this instability, I observe dips that have a more regular character than the early instabilities. I usually see the first ‘regular’ dip within the first few minutes. Thereafter they occur at 10-12 minute intervals when I am in the aerobic zone. In addition there is almost always a dip within 1 minute after I drop back into the low aerobic zone after an effortful burst around the lactate threshold. I have paid attention to the various fluctuation in my bodily function, such as re-adjustments of breathing rate and changes in posture, and have not been able to identify observable change in body function or sensation that coincides exactly with the dips, though I have not focussed on burps. By ‘burps’ I presume you mean release of air from the stomach via the oesophagus? I rarley produce audible burps but probaly do emit minor burps, so I will try to focus on the these in future. Inspection of the your HR traces shows a consistent marked drop in HR followed by a peak a minute later and then another drop about 2 minutes after the first drop, occurring at around 30 minutes and again around 60 minutes, during different sessions. Do you habitually take a drink of fluid at these time points? If respect to your comments concerning my dips at 30 and 60 minutes. For some reason I tend to push myself just before those times during an extended session and back off a bit right after resulting in those consistent the changes noted. Steve, I have just done a 40 minute session on the elliptical. At 33 minutes I was aware of a minor burp – a definte sensation of a wave of contraction in my oesophagus, though there was no audible burp. On examing my HR trace afterwards, I found there had been three HR dips during the 40 minute session, including one occuring at 33 minutes. So it does appear that burps are the cause of the dips. Thanks for drawing my attention to this. Note added 29 Nov 2010: I have now observed the assocation between burps and dips on mulitple occasions. and am convinced that burps are the usual cause of dips. Now I know this article is interesting but a little hard for me to understand. Anyone has a clue why this could be? Although HR and HRV behave in a fairly predictable way in response to changes in level of exercise and also show fairly predictable long term changes in response to training, the control of the sympathetic and parasympathetic nervous system and the way the heart reacts to changing sympathetic and parasympathetic signals is complex so there are many reasons why unusual things might happen. The usual immediate effect of an increase in level of physical activity is for HR to increase and HRV to decrease. The usual long term effect of training is for HR at a given level of activity to decrease, and for HRV at rest or at low levels of physical activity to increase. However there are many exceptions to these principles. One exceptional situation is the parasympathetic form of overtraining that occurs are prolonged excessive training. In this situation, the rise of HR as activity level increases tends to be suppressed. Also there is an abnormally large HRV at rest. However that does not appear to be the situation you describe. Another exceptional situation arises when rogue pacemaker muscle cells at the junction of the pulmonary veins and the left atrium generate ectopic heart beats. This sometimes occurs during periods of increased sympathetic activity, and results in erratic extra heart beats as the intensity of exercise increases. However in other cases it happens as sympathetic drive is decreased (or parasympathetic drive is increase) so erratic beats occur after the cessation of exercise, or during expiration. Perhaps this might be happening in your case though it is not possible to give a definite answer from the information you have provided. If you are getting a lot of irregular heart beats after stopping exercise or when breathing out, I would suggest that you should discuss this with your doctor. My own opinion is that the training paces should be based on a reasonable predicted marathon time. Because Furman recommended paces are quite fast, there is a serious risk of overtraining or other injury if you set the paces too fast, so if in doubt it is best to set a conservative target marathon time and calculate the paces relative the conservative target. I think the answer to the question of whether you recent 5K time is a good guide depends on your training and racing history. If you have previously trained for distances up to 5K or even 10K, but not for longer races, I would not aim for a marathon time any faster than that predicted by your current 5K time. However if you have mainly trained for longer races, then your current 5K time might under-estimate your potential marathon pace. However if that is the case, I would expect that you will already have evidence about your potential marathon pace based on longer races. If you have only recently commenced regular training, it is definitely best not to exceed the paces indicated by your recent 5K time. As stated above, the most important thing is that you are likely to do more harm by estimating a potential marathon pace that is too fast, so unless you have already done a lot of long distance training, I would recommend that you use training paces based on your current 5K time. One final comment about HRV from me. Have you checked out the Kubios Software package from http://kubios.uku.fi/ ? They make available a very robust package with registration. I have this and it is very nice and produces metrics much beyond my present understanding. Click on the download link and follow the instructions. Basically, you have to request a license to use it. They made it available to me. Steve, Yes I have registered with Kubios and have downloaded their excellent software, which calculates many interesting quantities related to heart rate. This is old, but have you taken a look at Bioforce? I am not familiar with Bioforce. If you are referring to Bioforce herbal remedies, my response is that some herbs can affect the balance between sympathetic and parasympathetic nervous system. Perhaps the most widely consumed herb that has the potential to do this is caffeine. At low to moderate doses caffeine increases HRV at rest, though the evidence is inconsistent. I suspect that on balance, high doses of caffeine have a deleterious effect on autonomic balance. As regard to other herbs, as far as I know, in most instances the effects on autonomic balance are even less clear than with caffeine. Thanks. There are a number of commercial companies that produce equipment that will record HRV, using a Polar (or similar) belt and transmitter to detect the R wave, encode it and transmit the signal to an appropriate receiver. In the era of modern electronics, the technical demands are relatively straightforward. I would therefore anticipate that the quality of the HRV measurement produced by the device made by any reputable company will be technically adequate. The more important question is how the data is interpreted. Bioforce apparently relies on a resting state measurement. This can be informative about possible over-training etc. My own experience demonstrates that it is possible to produce reasonably consistent results from resting state measurements, though I prefer to have the ability to follow up on any unexpected changes in resting state HRV with an orthostatic test to provide a fuller understanding of the nature of the changes in autonomic balance. However, for this it is necessary to have a monitor that records beat by beat variation (eg Polar RS800 or Suunto T6). If Bioforce is cheaper, that might be a consideration. However my current conclusion is that the interpretation of HRV is less straightforward than the relatively simplistic advertising material produced by commercial companies appears to imply. Therefore, for anyone who plans to use HRV to monitor training I would recommend a monitor such as Polar RS800 or Suunto T6. While I think HRV is useful for identifying overt over-training, I am less convinced by its value to monitor and adjust regular training load. The Kiviniemi study that reported greater gains from HRV adjusted training is certainly thought provoking, but I am not aware of any replication of their findings. I would be sceptical of any commercial company that makes strong claims about the ‘proven’ value of using HRV to adjust training load. Bioforce is a rebranding of ithlete. Bioforce is made by Simon Wegerif and HRV Fit Ltd. on behalf of Performance Sports Inc. It costs double the price of ithlete. The sellers of BioForce claim that they have improved on ithlete and that Bioforce might even give different recommendations that ithlete. I have ordered ithlete and intend to use it at least to prevent overtraining maybe to adjust training load too. I have been having terminal insomnia which I have found mentioned as a possible result of overtraining and I hope ithlete might shed some light on this. The owner of this blog seems very able in technical issues related to HRV and training in general but even if I had a Polar RS800CX I do not know that I would be able to read the R-R recordings with enough knowledge to make any useful interpretation of the data. (Instead I own an RCX5 that Polar decided did not need to share HRV data with the owner in any transparent way). I do not fully understand the relationship between Simon Wegeriff and Bioforce, but assume that Simon has entered into a commercial arrangement whereby the Bioforce package includes the Ithlete device with a somewhat different interpretation of the data that the device produces. I do not want to get too deeply into speculating about the merits of different interpretations of the data. My experience of the relationship between HRV and over-training leads me to be cautious about over-interpretation of HRV data. The complex body of evidence indicates that overtraining involves many aspects of the neural, hormonal and metabolic processes in the body. Whether or not a simple measure of autonomic nervous system function such as HRV is adequate to provide a reliable test for over-training (or to monitor training effects) is not proven, though I think that resting HRV its probably the most informative simple measurement that it is feasible to make. I have a great respect for Simon Wegeriff and consider he is a trustworthy expert on HRV. I also believe that he produced the Ithlete as a result of his expertise in HRV, his technical ingenuity and a genuine interest in developing a reliable device. In fact, if I did not own a heart rate monitor that records beat by beat R-R intervals, I would be very tempted to buy Ithlete. However, on account of my own experience, I would interpret its output with a great deal of caution. I am more concerned when I read the type of advertising material produced by Bioforce, because I believe that professionally produced anecdotal evidence about a novel technology presented without detailed reference to rigorous scientific evidence is potentially misleading. This presents a dilemma to the user who does not have direct access to the relevant knowledge. I think that we will only develop a good understanding of how useful HRV is in practice when we can combine information obtained in rigorous academic studies with observation of how the technology works in everyday circumstances. But the challenge is how to obtain that ‘real world’ evidence without doing harm to individuals who purchase the device. Most important is the need to be a little bit cautious in accepting the claims about the device, though ironically, too much scepticism itself can prevent a person obtaining the benefits of anything new. I think that with this technology in its present state, the best thing is to obtain the device from a company that will provide personalised advice. I wish you well and hope that you do find that measurement of HRV is useful. I found your internet site from Yahoo! News and think it is good. I’ve been trying for a long time to have my website listed there, could you tell me how you did it please? I do not seem to be able to manage it so am wondering what the secret is. Thanks! Recently a device for estimating power output during cycling from heart measurements called Powercal has become available. To many people’s surprise it seems to work quite well and the makers advise accuracy isn’t improved by calibration to an individual. It is known to use HRV but how it works is unknown. Have you any knowledge on how to measure power output from HRV. A review of the product is at http://www.dcrainmaker.com/2012/11/cycleops-powercal-in-depth-review.html . The short answer is I do not know how the PowerCal works. where HR is heart rate; dHR/dt is rate of change of heart rate; and a, b and c are constants. It appears from the BikeHabit data that a is approximately 2.5 watts per beat/min and b is approximately 3.5 watts/beat/min/min. C is less easy to estimate, but appears to be a negative number in accordance with what would be expected if the equation is to be valid at rest. dHR/dt measures the change in HR as the cyclist exerts greater effort. Negative values indicate decreasing effort. This change in HR as power output changes is not what is usually meant by HRV. HRV usually refers to the scatter in HR values about the mean value in the period of interest. So, if my guess is correct, PowerCal is not using HRV in the usual sense, but simply the adjusting the relationship between power and HR by an amount related to the change in HR with changing effort. I had a look at my own data for HR v power on the elliptical cross trainer. This equation works fairly well for me with a=3 watts/b/m and b=4 watts/b/min/min. So it appears that a simple algorithm of the form a*HR + b* dHR/dt + c can work fairly well, but the values of the constants a, b and c will vary by a moderate amount according to the person and the mode of exercise. Unfortunately because there are three constants to be adjusted, a precise calibration procedure would be tedious, and maybe that is why CycleOPs have dropped the recommendation for calibration. Fortunately, the value of b will make little difference to the estimate of average power over a long ride as the sum of all increases in HR must approximately equal the sum of the decreases. However, a and c will vary between individuals. In my own case, a is fairly constant as my level of fitness changes, but the magnitude of c decreases quite appreciably as I get fitter. If I do not adjust c, I would under-estimate my power output by about 50 watts at any given HR as my fitness changes from ‘off-season’ to peak fitness. However, it must be noted that this is all speculation based in inspection BikeHabit’s data. Thanks for the thought you have put into this. I’m reasonably confident the algorithm isn’t that simple. In your example, Bikehabits a = 2.5 and your a = 3 which is 20% more. All of the reports claim it to be more accurate than that and this is just one example. It would be tedious to calibrate and an earlier version required it, but CycleOps claimed they got just as good results without calibration. See the CycleOps quote in section “8) Calibration – You can still do it”. at http://www.dcrainmaker.com/2012/11/cycleops-powercal-in-depth-review.html . This goes against accepted wisdom for the relationship between heart rate and power. DC Rainmaker said in reply #14 that an earlier version used the cadence data but they’ve been able to do away with that. It also doesn’t work for running and it is good at detecting no power output so there is some clues there. Running requires constant power but cycling has periods of no power output, frequently following straight after high power output. I think it is detecting these periods and something in the heart rate pattern during that time that allows it to be calibrated to a wide range of people. I think it was using cadence data to detect periods of no power previously but now they’ve found a way to do it without the cadence data. All of this is of course speculation. I’d like to write something about it and the initial question was part of the background research. I’d been expecting you to respond that it uses the technique published in ….. So now I know its not obvious how its done, even to an expert in HRV during exercise. You may well be correct. I hope that Powercal is more sophisticated. Here are my thoughts on the issues you raise. First, with regard to accuracy, a search of the internet readily reveals discrepancies of up to 20% or more for cyclists. The plot of Powercal watts v Quarg watts on the BikeHabit site implies an error of around 45% at 300 watts. In practice, the error would only be that large for a hard ride at high average power output . My estimate of the value for the constant a for my own data differs by 20% from my estimate for Powercal. However my estimate was for elliptical cross trainer data, for which the power estimate might to be somewhat different, especially as I was using the arms as well as legs. As you state, there is doubt about how well the Powercal algorithm applies to other exercise modalities such as running. Furthermore I am 66, which is likely to make an appreciable difference unless a very simple relationship is assumed. I have seen no discussion of the effect of age on Powercal, which make me suspect a simple relationship. With regard to zero values at rest, my formula does give zero values during rest. It could give negative values during periods of rapidly decreasing HR. I am fairly certain that Powercal simply ignores negative values. With regard to calibration, the illustration of the calculated power and HR in the figure provided by DC Rainmaker is consistent with an algorithm of the form I have suggested. You can see that immediately following each increase in work load there is an increase in steepness of the HR trace which subsequently levels off, but does not quite achieve a constant level before the next increase in work load. Despite the low resolution of the HR trace, this pattern is clearly discernible for the first 5 effort levels. When an algorithm of the form a*HR + b dHR/dt + c is applied to a HR trace of this shape, it predicts an almost flat power output (apart from a few ripples) throughout each three minute interval, as is in fact observed [provided the constants a, b and c are chosen optimally; see added note below]. 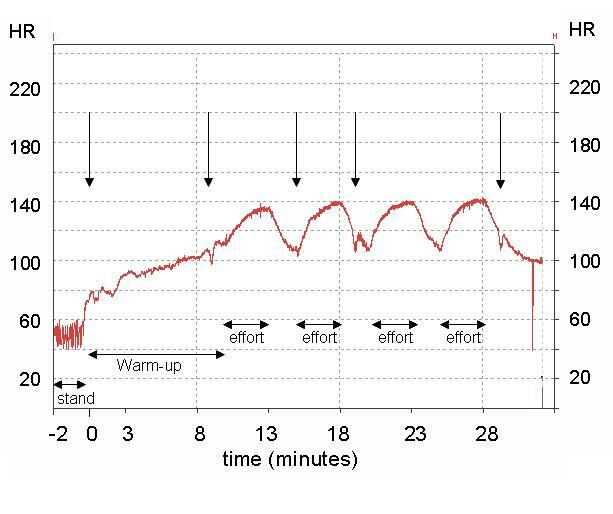 In the final 6 minutes of the test, the cyclist appears to increase power at two minute intervals and the HR trace fails to achieve a plateau. During this final six minutes, my algorithm predicts an almost continuous rise in power output, similar to that predicted by Powercal. This might be because both my algorithm and Powercal become less accurate as the cyclist approaches the anaerobic threshold, or alternatively that the cyclist did actually increase power output throughout the final 6 minutes. I have looked hard on the internet for any evidence that Powercal uses is a more sophisticated relationship between HR and power but cannot find it. In particular, CycleOps appear to ignore people who ask questions such as whether Powercal can deal with the increase in HR at constant power output when the cyclist is tired. So, as I said at the beginning, I hope Powercal does have a more sophisticated way of relating HR to power. I would be delighted if anyone can offer any suggestions as to how it might do this, or indeed any evidence that it does do this. For anyone who owns a Powercal, it would be worthwhile examining the relationship between average HR and average power for an easy ride and for a hard ride, such as a TT, each lasting at least 20 minutes. In principle this should provide all the information required to estimate a and c, assuming that b can be ignored. In principle, for a long ride the effects of b should be negligible, because the additions to estimated power from the dHR/dt term during increasing HR should be approximately cancelled by the subtractions during periods of decreasing heart rate. However, the likelihood that Powercal outputs zero whenever the algorithm gives a negative value might cause an appreciable inaccuracy. It you examine the data on the BikeHabit site, the shape of the distribution of power values suggests that Powercal has simply ignored negative values or replaced them by zero. This is what you might expect because head units are nor designed to handle negative numbers. Unfortunately, ignoring negative values will lead to an over-estimate of true power, and also will cause inaccuracy in an attempt to estimate a and b from an easy and hard ride. Added note: Despite the low resolution of the HR trace in the figure within DC Rainmaker’s description of calibration, it is possible to perform a very crude estimate of the parameters using that data. Because of the low resolution of the HR trace it is especially difficult to estimate b, as this parameter is sensitive to the change of the slope of HR v time during each 3 minute segment of the test. The values I obtain are a=3.25 watts/beat/min, b=3.6 watts/beat/min/min and c= -140 watts. 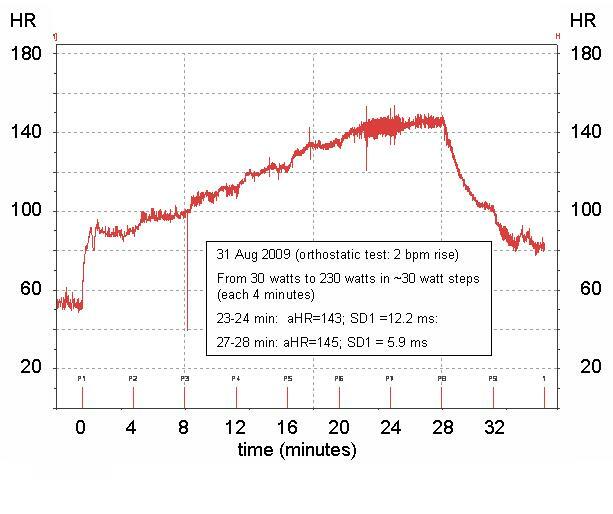 The difference between this estimate of a and the value of 2.5 watts/beat/min that I had estimated from the Bike Habit data is within the range of uncertainty expected when reading data from a low resolution graph (and also allowing for the possibility that the calibration was set differently for the two data sets). At this stage it is difficult to either confirm or refute my hypothesis regarding the algorithm without access to more precise data. Further added note: There is an intriguing dip in HR at 26min 40 sec in DC Rainmaker’s figure illustrating the calibration test. This was most likely due to a burp – the parasympathetic surge associated with a burp usually produces a dip like this. It is interesting to see that Powercal reacts to this dip in HR with a very small dip followed immediately by a peak in estimated power. This is what would be predicted if Powercal replaces negative values with zero during a rapid fall of HR. The small initial dip would underestimate the real fall in HR but as HR subsequently rises out of the dip Powercal would be expected to produce a spurious power peak. If you have a Powercal, it would probably be easy to check the various speculations that I have made. However, because it is likely that Powercal replaces estimated negative values of power by zero during rapid decreases in HR, the contributions to average power from dHR /dt during periods of decreasing HR will not cancel out the contributions from periods of increasing heart rate during a long ride if there are many sharp decelerations. Therefore, an estimation of a and c from average power during an easy ride and a hard ride would be expected to be inaccurate if there are many rapid decelerations. Therefore, during both rides, keep the number of rapid decelerations to a minimum. I own a polar RS800cx, and one of the displays during exercise is R-R (SD 1 or RLX) In real time. Very often when my ownzone suggests higher training zones , I feel fatigued, and the R-R indicator during very easy recovery training zones indicates an increased in High frequency heart rate variabilty.How high ? My rmssd and sd1 are higher while easy riding on a stationary bike compared to while rested after waking up in the morning.It is very important to keep a constant heart rate when measuring Sd1 and High frequency variabilty in order for these parameters to have any validity. So , even on my stationary bike I strive for a constant Heart rate. However, I am not a medical specialist. Thanx for the interesting Experiment on HRV during exercise. Unfortunately I could not get my Polar to display RLX in real time – even though the handbook. However my Polar has always been a little troublesome– and is getting worse as it gets older. Sending t back to the UK Polar dealer only led to an improvement in some of the problems, so I now simply accpet its faults. Although I have not been able to display RLX in real time, I often examine it in Polar Protrainer after the training session. As far as I can see, it is not quite the same as SD1, and I have been unable to determine exactly how it is computed. Therefore I focus more on sd1 and RMSSD. My experiences of the change in sd1 during exercise are a little different fromr yours. During the past year or so, my sd1 at rest is typically 80-100 ms, while standing in a relaxed state it is typically 60-80 ms. During very light exercise (eg 28 watts on the elliptical cross-trainer) it is around 10 ms, and at a constant work load of 60 watts is is typcially all to about 3 ms. at a work load of 60 watts, At higher work loads it is fairly constant at around 3 ms, untyil above the second ventilatory threshold (around 200 watts) when breahting becoems much deeper and sd1 increases again. As far as I can see, I experience a more dramatic differrence between standing and very light exercise than most people, though the usual pattern is a fairly rapid drop in HF HRV as work load increases from rest up to the first ventilatory threshold. (I agree that it is necessary to get HR fairly constant during the period over which sd1 is estimated). I am fairly confident that the subsequent increase in HF HRV above the second ventilatory threshold is main due to the mechanical effect of deep breathing. Hi, I am a 65 yr old with 50 years of running every day and many marathons under my belt. I usually run about 7 miles a day with one interval day and one longer day. Here is the concern when I push a run of over 1 hr i steadily climb in HR on my Polar from 120 to 145. Not feeling any strain, fatigue or discomfort I will spike to 168-172 range for a couple of minutes. It then settles back down. The question becomes am I about to have a heart problem? I feel great with no fatigue and have 2 easy days between hard days at a minimum. That is an impressive history of training. The first thing to exclude with unusual HRM readings is poor electrode contact. My own experience demonstrates that even with a great deal of care, contact is sometimes poor. I have found that the best thing is to keep the electrodes fairly clean by washing in warm soapy water once per week and moistening the electrodes with a low concentration salt solution before each run. If the rapid rate does arise from the heart it is by definition some form of tachycardia, probably arising from aberrant pacemaker cells. Any heart muscle cell can contract spontaneously, and if one does, it can temporarily take over the role of pace maker. Without a full ECG recoding it is not possible to estimate the likely location of an aberrant pacemaker. A rapid heart rate arising from within the ventricles (ventricular tachycardia) would be dangerous, but I think this is unlikely if one is not aware of any symptoms. A rapid pulse arising in the atria or walls of the pulmonary veins is what is known as a supraventricular tachycardia (SVT). Brief episodes of SVT are quite common in the elderly, possibly because local muscle hypertrophy or minor ischemic damage has altered the local muscle structure. I get occasional brief runs of SVT (typically 5 consecutive rapid beats), confirmed by 24 Hr ECG, which I consider to be harmless in themselves. Nonetheless, I regularly use a heart rate monitor capable of recording R-R intervals so that I can monitor for any signs of increased frequency of such events. I attempt to identify any avoidable circumstance that precipitate them, since I do not want to encourage the development of abnormal conducting pathways in my heart. However I would not consider giving up running on account of occasional brief episodes of SVT. I think the risks of not exercising are greater than any risk of precipitating tachycardia. If your episodes last for several minutes, I think it is worth discussing the experience with a doctor. I have something similar to this… I can be running along at a decent pace, no significant feeling of fatigue or discomfort, just EFFORT and suddenly I get a spike in HR that will either skyrocket my HR average, or the HRM no longer can track my HR… in extreme cases, it presents as a feeling like someone clotheslined me across the chest and is saying “STOP!” (so I do), but these episodes happen infrequently, and I’ve never felt any other sign of a heart attack at the same time.. just strange. If you get a feeling of constraint in your chest, I think it is very likely that you are experiencing brief bursts of tachycardia, due to an abnormal intrinsic pacemaker Abnormal pacemakers can be supraventricular ( that is, in the atria or adjacent pulmonary vessels) or in the ventricles. If it is supraventricular this is probably not in itself dangerous. However if the rate is very high, there will be inefficient filling of the heart and therefore inefficient pumping so both your heart and skeletal muscles will be deprived of oxygen. Stopping is the right thing to do, but once the tachycardia has settled, you will be able to run again – though I personally would take things easily for a while, to minimise risk of another episode of tachycardia. If it is ventricular tachycardia that is very dangerous as it could lead to ventricular fibrillation. However supraventricular tachycardia is more common than ventricular tachycardia. You’ve presented some really interesting data. The connection of heart rate in comparison to exercise seems obvious but I never thought of the implications on the nervous system, especially for people like me who use exercise as a stress -reliever. In fact, I began exercising after a Heart Rate Variability Test showed that I should take steps to improve my physical health to better prevent diseases. I am interested to see what the future of these tests and experiments will tell. Finally i got an explanation to the HR dips i have experienced for years. I also find them to be associated with burps/hickups as discussed with steve in 2010. My understanding is that the pressure from the burp somehow activates the baroreceptors and subsequently the parasympathetic pathway with a negative feedback on HR. Have you suggestions on how to avoid the phenomenon? Soren, Thanks for your comment. With regard to mechanism, as I understand it, during deep inspiration a very small amount of air gets past the upper oesophageal sphincter and travels down the oesophagus into the stomach. After about 10 minutes of mid-aerobic running, enough air has accumulated in the stomach to raise the pressure to a point that triggers a signal to the brains stem indicating need for a burp to relieve the pressure. This requires opening of the lower oesophageal sphincter. The lower oesophageal sphincter normally prevents regurgitation from stomach to oesophagus. It is controlled by a balance between sympathetic activity, which tends to keep it closed, and parasympathetic activity which opens it. The signal from stomach to brainstem indicating the need to burp triggers a burst of firing of neurons in the dorsal nucleus of the vagus in the brain stem, This burst of parasympathetic neural activity travels via the branch of the vagus to the oesophagus and opens the lower oesophageal sphincter thereby releasing the trapped air, and relieving the pressure. However there is some overlap between the effects of the dorsal nucleus of the vagus and the nearby nucleus ambiguous which sends fibres via the vagus nerve to the heart. Spill over from the burst of parasympathetic activity that opens the oesophageal sphincter travels via the branch of the vagus that regulate the heart, producing slowing of heart rate lasting for about 10 seconds. If air has accumulated in the stomach, it is generally best to let it out, so prevention of burping is unlikely to be desirable. Maybe if one could achieve tighter closure of the upper oesophageal sphincter during inspiration this would minimise the entry of air into the stomach, but I doubt that it is worthwhile trying to achieve this. Very nice…thanks for detailing out the machanism! Did not realize that the air is actually accumulating as part of the respiration but it make sense and explain the regularity and periodicality in the dips. (tried to paste a diagram of my latest run for illustration but no graphics possible i guess). The HR dips is not really something that i notice/feel during excercise and the burps are not really disturbing for my excersice. Only thing is that the HR dips influence the average HR calculations and the 10-20 sec dips looks strange on the screen when i attend spinning classes with on-screen information on HR data. can I ask a question… I have both PVC and PACs that have shown up in the last five years… a holter test showed nearly 14,000 a day… something that happens during my exercise is that I begin running/jogging and get to a nearly constant pace at 15:00 per mile but my HR continues to climb almost in a linear fashion over the length of my run. Most runs are about 2 miles or 32 minutes in length, and for a long period up to about 1.2 miles, HR will remain relatively constant at 136-142 (I am 53, male, and 330#), but then it begins the climb without any significant feeling of being tired or breathless. Just wondering… thanks. There are many different factors that can cause heart rate to rise steadily during exercise. 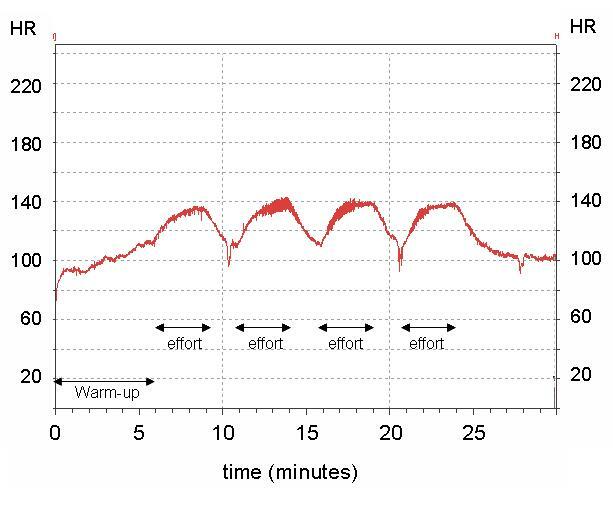 It is quite common to see a rise slowly during the first 2 miles of easy paced running. I think that the main reason for this is availability of oxygen attached to myoglobin. Myoglobin is a protein that occurs in muscles and is able to carry oxygen. At rest, most of the myoglobin molecules will have an attached oxygen molecule. When you start running , this oxygen can provide a small portion of the oxygen required for muscle contraction. My own experience suggests that myoglobin can supply about 5% of the oxygen required for easy paced running for about 2 miles. Typically, during an easy paced run (around 9.5 min/mile) I observe that during the first few minutes heart rate rises rapidly to around 70% of maximum and rises very slowly for the next mile or two. After around 2 miles, it has risen to around 75% of max and then remains fairly constant for many miles. I think that in the first two miles of easy running I am obtaining about 5% of the required oxygen from myoglobin, but by the end of mile 2, I have exhausted this reserve supply, and thereafter the heart must pump enough blood to provide all of the required oxygen. It appears that your heart rate is somewhat higher than mine at an easy pace. This is most likely due to the fact that I have large stroke volume so each beat delivers a large amount of blood. I do not know what effect your frequent PACs and PVC’s would have on this rise.